UC Davis Virtual Clinic gives patients access to medical advice from home or office. I knew my symptoms weren’t that severe, so I decided to talk with a practitioner without having to leave work. When Kristine Seraspi’s allergies advanced to include a cough, she weighed her options. 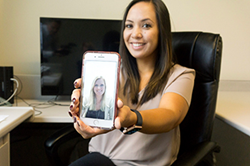 Try to find time in her busy schedule to squeeze in an appointment with her primary care physician or check out UC Davis Health’s Virtual Clinic, a secure online diagnosis and treatment service that connects patients with practitioners on demand. “I knew my symptoms weren’t that severe, so I decided to talk with a practitioner without having to leave work,” said Seraspi, an analyst supervisor in Clinical Operations at UC Davis Medical Center. Seraspi called the UC Davis Virtual Clinic toll free on her iPhone, paid by credit card and was connected with an advanced registered nurse practitioner 15 minutes later. Seraspi is one of the first to try the new virtual clinic, a partnership with national telehealth provider Carena, Inc. The UC Davis Virtual Clinic is a simple online diagnosis and treatment service for common, low-acuity health conditions such as cold, flu, pink eye, rash or sore throats. The clinic aims to make health care more affordable and accessible to anyone with a web-enabled device. Care is provided by board-certified physicians or nurse practitioners employed by Carena. The fee for a virtual visit is $40, payable by credit card. The clinic is available for UC Davis and UC Davis Health employees as well as UC Davis patients and the general public. No appointment is necessary. Patients complete a brief online registration form before speaking with a primary care physician or nurse practitioner by telephone or using online software, such as video chat, Skype or FaceTime. The provider then diagnoses and treats the patient, or refers the patient to a primary care provider or nearby emergency department as needed. Virtual Clinic providers also can send prescriptions to the pharmacy of the patient’s choice. “While many of our clinics already offer same- and next-day appointments for urgent care, virtual care is yet another way of making health care easy and accessible for those we serve,” said Michael Condrin, director of clinical operations at UC Davis Medical Center. “We recognize that people have different needs, so on-demand care provides another option for those who may prefer to avoid an office visit but still want quality and personalized care. Research shows that the public has embraced the convenience of this type of telehealth,” he said. The visits do not take the place of routine primary care. Virtual Clinic staff can assist patients without a provider in choosing a UC Davis primary care physician, if interested. The Virtual Clinic will be available 24/7, 365 days a year. However, insurance is not accepted.